The more I study world religions the more I realize I have so much more to learn and the more I realize I don't know as much about world religion as I once thought I did. 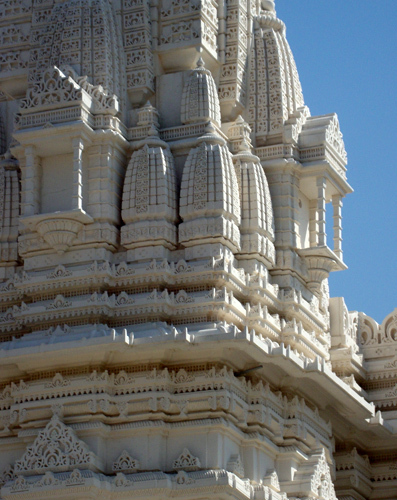 A visit to the BAPS Shri Swaminarayan Mandir, the largest Hindu temple in the United States, was a sobering reminder of this fact. I've visited many countries around the world and toured many churches, temples, and synagogues, but I've never seen anything quite as exquisite, as intricate, as breathtaking as the BAPS Mandir…I find myself struggling for the words to convey its beauty. What I really wish is that I had had my Great Aunt Kathy with me on this tour. An award-winning poet and a published author, she could quite eloquently convey the beauty of the BAPS Mandir via the written word, but I'll put forth my best effort. 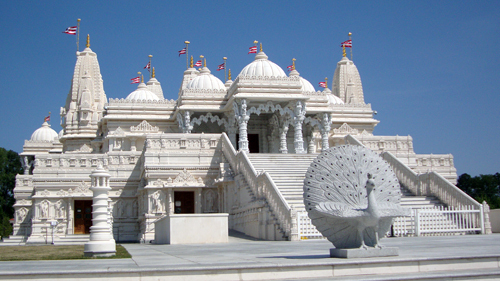 The BAPS Shri Swaminarayan Mandir was inaugurated in August of 2007. Using 1.3 million volunteer hours (an amazing feat in and of itself! 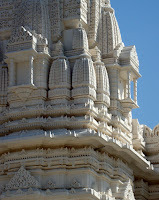 ), the mandir was constructed in only 17 months. 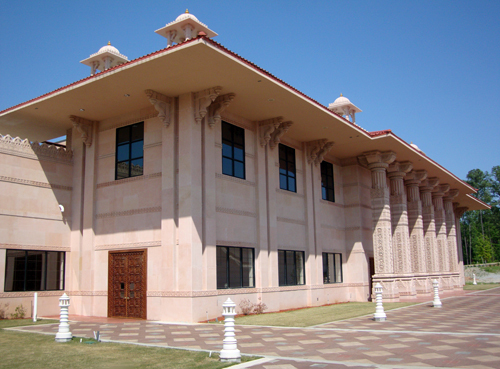 The mandir is comprised of three kinds of stone, including: Turkish limestone, Italian marble, and Indian pink sandstone. 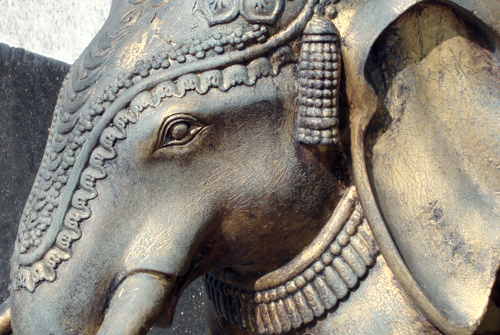 There were more than 34,000 individual pieces were carved by hand in India, shipped to the United States and then assembled onsite. Before going further, I should mention that the photos in this post are of the outside of the temple and of the grounds. Photography inside the mandir is not permitted, and for very good reason. 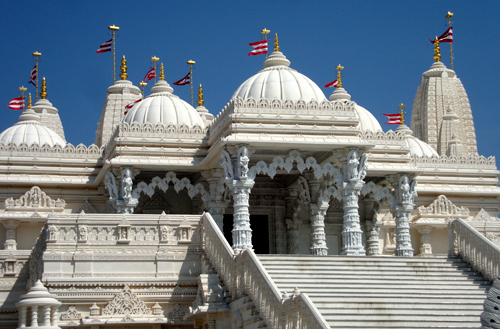 Unlike most tours that prohibit photography, most frequently to prevent copyright infringement, the BAPS mandir is a place of worship. 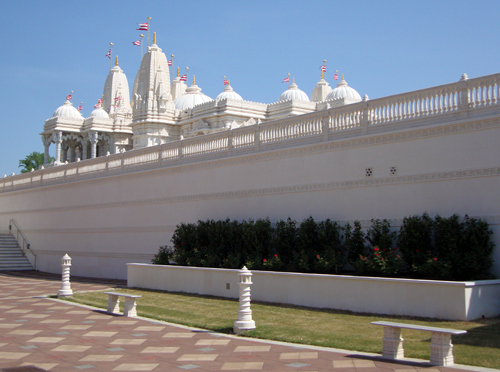 The temple grounds are open every day except Sunday, but the mandir is open only certain hours during the day. I arrived knowing already that photos inside were not permitted, so I allowed ample time to make photos of the exterior before one of the regular open times of the mandir. When I got there, I was mystified, and could hardly believe I was in Georgia, when I saw the temple from Lawrenceville Highway and Rockbridge Road. I have several friends from India who have shared their vacation photos with me that always include historic temples, which I thought were only in India or other parts of Asia. Not so…this BAPS Mandir is smack dab in the middle of Atlanta suburbia. I have not learned the official reason for the selection of this location, but I’ve been told that there is a sizable Indian/Hindu population in the Lilburn area, where the Temple is located. As soon as I came over a hill on Lawrenceville Highway, there was no mistaking that I was in the right place. The Temple wasn't even looming in the distance…it was right there in front of me. Finding the entrance was also easy. I was wondering to myself, "Why had no one told me about this?" A little nervous, not knowing what to expect, I approached the gate and was welcomed by a guard. He took my name, for security purposes, and granted access to the complex. Signs are clearly displayed marking the directions to guest parking, of which there is plenty. When it was time to go into the Mandir, I was well beyond excited, but had prepared myself to be respectful of another culture's spiritual space. This was going to be much more than your typical tour. 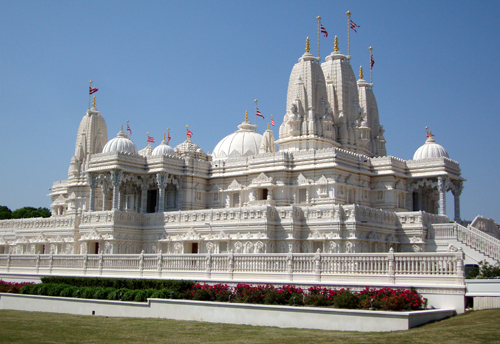 "Mandir is the name for a Hindu place of worship and prayer. The word mandir is composed of two words, man and dir, whose meanings are ­mind and still, respectively. Therefore, a mandir is a place where the mind becomes still; a place where we experience peace from worldly problems." I followed an Indian family into the mandir, the same ones I'd passed while exploring the grounds…we were the only ones there for the 11:15 p.m. time slot. Upon entering we removed our shoes and placed them in provided cubbies. We walked into the first room, which had an attendant and is adjacent to the room where a puja (reference to all forms of Hindu worship, including prayers, prayer rituals, and offerings) takes place. On my way out, I saw a puja prayer ritual taking place. It included two men pouring water over the head of a statue of a Hindu god, a woman chanting while circling the area where the men were pouring, and a mandir spiritual leader offering a prayer on behalf of the group performing the ritual. It was as fascinating to watch as I'm sure some of the North American religious rituals would be to first-time visitors from India…theirs was strange to me, but luring nonetheless. 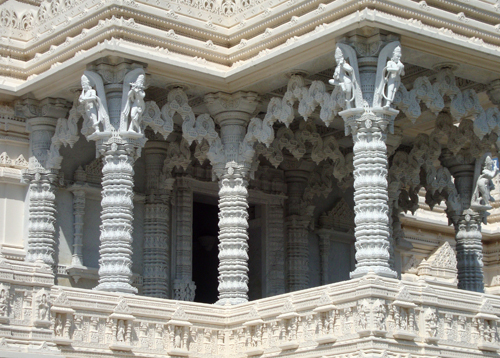 When I entered the main room of the mandir, my senses were overwhelmed by what I saw—pure beauty. I knew I wasn't dreaming and I definitely knew I wasn’t in a movie (got to love Hollywood magic)…this was the real thing. Every pillar, floor, wall, and dome was deliberately intricate, every one told a story (or stories! ), every one captured my attention…no carving was to escape my attention. There were children sitting quietly in the middle of the room under the most incredibly amazing dome I’ve ever seen. This Sistine Chapel's ceiling is beautiful, yes, but I've never seen anything as intricate, as detailed, as complex as this dome…and did I mention that it's beautiful? Along the walls are statues of certain Hindu gods. They’re not small, but not quite life-size and they’re brightly colored and accented with gold. They’re behind iron gates (presumably for protection), but easily visible. There are dozens of column throughout the main room, each decorated with carved design elements and carved figures, including some I actually recognized. There are carvings of animals throughout as well, including lots of elephants. Again, I find myself at a lost to convey just how incredible beautiful this mandir truly is…I hope you’ll visit it yourself for what I promise will be a memorable experience. While exploring, you may very well see visitors praying or engaged in a spiritual ritual, as I did. The rituals were as unfamiliar to me as were the rituals I saw when visiting my uncle's church as a child (now that was an experience!). All the other visitors were also respectfully quite. When I got back outside I continued exploring the grounds. I stopped by the recreation center, complete with intricate columns and beautifully carved wooden doors. The beauty continues with an elephant fountain and reflecting pool. The end of the pool closest to the mandir is a row of elaborately decorated elephant heads spouting water. The pool was actually undergoing maintenance while I was there, so I want to go back to see the fountain fully working. I mentioned that photographs are not allowed inside the mandir, but there is a nice collection of postcards in the Gift Shop, many of which have photos of the inside of the mandir, so you can walk away with a photo keepsake of your visit inside…in addition to the memory of such beauty emblazoned on your memory. 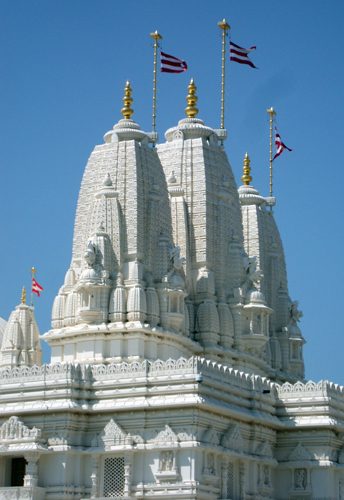 Will I return to the largest Hindu temple in the United States? Will I go back to the BAPS Mandir? Absolutely. I learned more about Hinduism in a single visit there than I have in a lifetime on the outside and the temple is so incredibly beautiful…I welcome the opportunity to be surrounded by beauty and serenity. love this place, at night is is all lit up blue, breathtaking! Thanks for posting. I wanted to go, but was being a chicken. Your post is giving me the assurance I can go without making a fool of myself!